I get really peed off whenever I walk at a popular fishing spot and find lengths of discarded fishing line all over the ground. Then I wonder – did I do that when I used to fish? Probably did. I’m sure there were times when I dropped off-cuts of line without thinking. If I’d known about the damage fishing line does when it gets caught around the feet of a wandering bird I would never have dropped an inch of the rotten stuff. Entanglements occur often to birds that forage in coastal areas where fishing is popular. Birds with blunt beaks suffer the most because they have no hope of biting through the line and freeing themself. Vulnerable species in my area include pelicans, swans, ducks, oyster catchers, gulls and ibis – although no species is immune. Birds of prey like kites and osprey are a little less vulnerable because they have sharp hooked beaks that can sometimes cut through line. But of course a sharp beak is of little use if a fish hook is also involved. 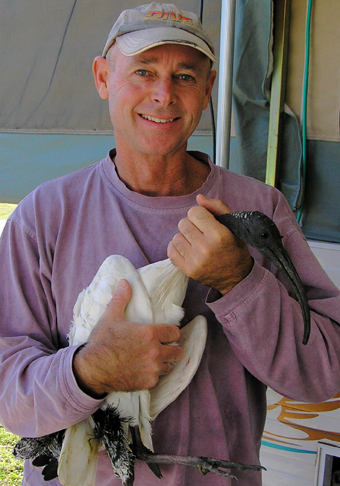 More than half of the entangled or hooked birds that I rescue can be treated on the spot. First, the line is cut from the affected limb(s) and any hooks are removed. Minor lacerations are doused with a weak solution of iodine. The creature is then released straight back into the air. This process is usually quick and causes minimal trauma to the bird. Recovery is rapid because experience shows that birds heal faster in a stress-free natural environment. In fact I often come across a bird that I’d caught and disentangled only days before. Some were so disabled they could barely walk. Now they’re strutting around as happy as Larry. Birds with a severe injury caused by fishing line or a deeply embedded fish hook require veterinary attention. Sometimes the treatment will mean weeks in hospital and a period of rehabilitation with a wildlife carer. Most birds survive these injuries, albeit without a toe or two and sometimes without the full use of a leg or a wing. There are so many stories about entangled birds that I’ve rescued, but this next story illustrates, quite graphically, how horrible and dangerous fishing line and hooks can be. I received a call about an injured bird from a man who was staying in a local tourist park. As luck would have it I was camped there myself. In fact I’d already caught two ibis and one pelican during my first week in the park. All had fishing line or hook injuries. The caller said that he was feeding a flock of ibis by his caravan and could see one with fishing line wrapped around its beak. The beak was lashed firmly shut, preventing the bird from eating. An ibis that can’t eat won’t last longer than about 5 days before starving to death. I asked for the location and was delighted to hear that he was only 30 meters (100ft) from me. Yehaa! I dream of getting calls like that. Normally the rescue location is 50 kilometres away! I was there in a jiffy. The ibis had already started to walk off. There was no reason for the poor thing to hang around because it couldn’t share in the food. I knew this might be a tough capture because rescuers use food to manipulate birds into a position where they can be caught. If a bird won’t come for food it can be very difficult to catch. I decided to set up my capture equipment some distance from the bird. That gave room to move. Then I managed to convince some poor, unsuspecting passer-by to help me. Little did he know just how bad ibis smell up close, and of course, there was no time to tell him. We were on a mission and the pressure was on. I was prepared to deal with a hostile and smelly assistant later. We fanned out and slowly and carefully drove the unsuspecting creature towards the capture gear. For once luck was on our side. The ibis walked straight to where I wanted. At the last second I threw food and the bird stepped forward in a vain attempt to eat. Two seconds later, we had him. My new assistant dived in fearlessly and helped to secure the struggling bird. Clearly this man was made of steel. He wasn’t even slightly put off by stinky feathers, rusty fish hooks or ibis spit. Sometimes I wonder why I do this job ’cause all of those things put me off! It was immediately evident the bird had several wraps of fine fishing line around its beak. To add insult to injury a ball sinker was dangling from the end of the line. Thin, light weight fishing line is dreadful stuff because it knots so tightly. The ibis had no hope of freeing itself. My trusty assistant held the bird down while I went to work with scissors. I slowly cut the wraps of fishing line from its beak. Then the question dawned on me – where was the other end of the line? I hadn’t even stopped to think about that. Of course it was in the only place it could be – down the bird’s throat. That was not good. 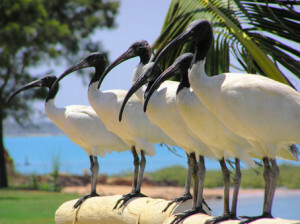 If the ibis had swallowed a hook, which was very likely, it would probably need surgery. We had to check. I held the bird’s beak wide open and peered down its throat. Did I mention ibis breath? No, didn’t think so. We were in luck – although it’s doubtful the ibis saw it that way. The hook was visible. It was small and buried deep in the back of the bird’s tongue. Ouch! There were two choices. Put the bird through the stress and us through the time and expense of a 70k round trip to the wildlife hospital, or attempt to force the point of the hook through the last millimetre of tongue to expose the barb. Sounds gruesome but if teenage girls are willing to pay for tongue studs I was happy to provide a similar service for this ibis – for free. My assistant – now a veteran – agreed it was the best way to go and definitely the least traumatic option for the bird. The pain would be over in a split second and the creature would be only minutes away from snatching its first hot sausage from the nearest barbeque … possibly its first meal in days. In an extraordinary display of athleticism my trusty assistant held the creature still while we each took one side of its beak and prised open its mouth. I manoeuvred needle-nosed pliers to the back of the bird’s tongue and grasped the shank of the hook. A quick flick and the barb cleared the flesh. The bird didn’t even flinch – no doubt dreaming of hot ‘snaggers’ to come. A quick change of tool and side cutters were used to nip the barb off the hook. With the barb removed the shank of the hook could be backed out of the birds tongue. The operation was over in seconds. I released the creature immediately. Then my assistant and I dutifully inspected each other for lice. I don’t think I mentioned lice? Rather than fly off, as most birds do following the stress of a capture, this little fellow took a few hops and then casually sauntered down to the water’s edge, dipping its beak into the water several times. Then it threw back its head and I swear it was gargling with the salt water. Who said ibis were silly? I’m delighted to report seeing that bird the next day strutting around the park looking happy and healthy. I know it was the same creature because it was of small stature and had a distinctive, draggy left wing. In fact I saw it nearly every day for a month. It’s a good feeling to know that you’ve saved a wild bird from a slow and awful death; a by-product of fishing – a sport that’s heavily promoted as a family activity. Yet we’re rarely told about the terrible consequences that fishing has for so many innocent creatures. While walking at some local fishing spots it’s quite usual for me to find 30 meters (100ft) or more of discarded fishing line. Any length longer than 300 millimetres, or a foot in the old measurement, can cause severe injury to a bird. You can help by collect discarded line. Simply keep your eyes peeled whenever you’re near water or at a popular fishing area. If you find a length of line, wind it up into a tight ball and put it in a bin. Even better – cut the line up into short lengths before binning it. These precautions are necessary because, believe it or not, many birds, including pelicans, become entangled at the rubbish dump in fishing line that’s arrived in the trash. If you fish, or if you know a fisher, tell them how destructive discarded fishing line and hooks can be and ask them to dispose of those items properly. Remember that every piece of line you collect could save a beautiful bird from months of suffering or even the loss of its life. The amount of fishing line discarded on land is a ‘drop in the ocean’ compared to the amount lost in the sea every year. Unless you dive and have witnessed this for yourself you’d be shocked to see the spider’s web of broken off fishing line that adorns the rocks in some of the local fishing areas I visit. This ghost line can take years to break down. In the meantime it acts as a silent and lethal trap for diving birds like cormorants, gannets and terns, plus many underwater creatures, especially turtles. Every day the amount of fishing line lost in the ocean increases. Out of sight, out of mind, I guess. 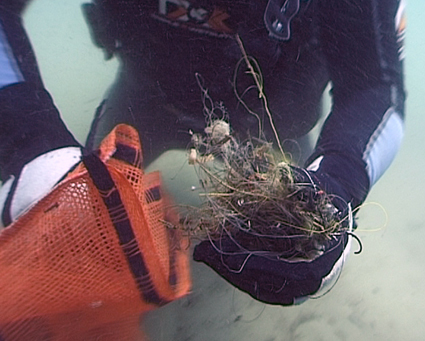 A diver fills his bag with broken off fishing line and hooks collected amongst the rocks at a popular fishing spot.